This February Sean Conroy and I took care of Wild Harmony Farm in Exeter, Rhode Island! 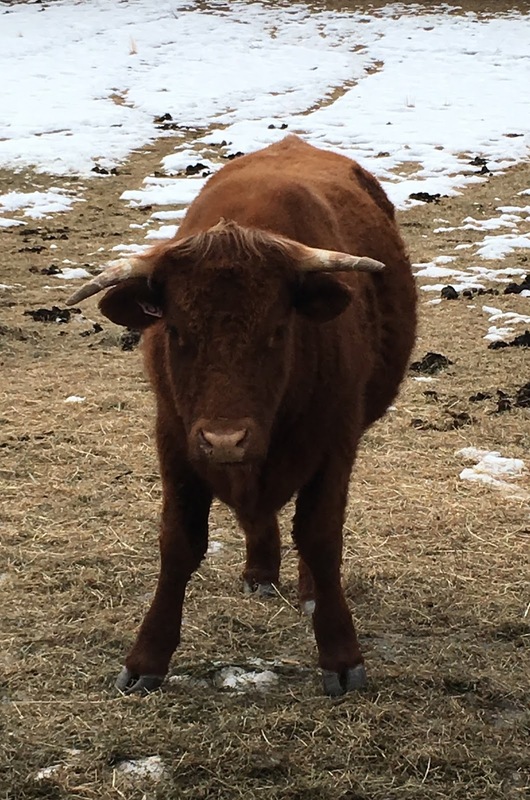 This polycultural farm features beef cattle, chickens, pigs, a vegetable garden, raspberries, blueberries, an apple orchard, maple trees, and bees. On our first day, we helped farmer Ben Coerper gather sap from maple trees. The maple sap gets boiled down to remove excess water to produce maple syrup. It takes 40 gallons of sap to produce 1 gallon of maple syrup! We also fed and watered the animals, including USDA certified organic Berkshire and Berkshire-Cross hogs that rotationally graze in the woods. The Red Devon cattle also rotationally graze and are 100% grass fed. They are only given hay during the cold months and have access to fresh grass during the growing season. In the winter, the chickens have access to the barn for protection from the cold weather. The chickens are USDA Certified Organic and provide organic eggs. During the growing season the chickens rotationally graze behind the cattle herd on pastures, eating grass and bugs while providing fertilizer and managing pests on the farm. Organic meat: what does it mean? The pigs, chicken, and eggs at Wild Harmony Farm are USDA Certified Organic. Organic businesses need to show they are protecting natural resources and biodiversity. To meet organic livestock requirements, animals need to live in an environment that accommodates their normal behavior and health with year-round access to the outdoors. They must be raised on certified organic land and fed 100% certified organic feed. At Wild Harmony Farm, animals are fed organic and non-GMO grains. Animal health and welfare standards must also be met. Livestock cannot be given antibiotics, added growth hormones, animal byproducts, or other prohibited ingredients. Learn more about USDA organic regulations. It was a fun week on the farm! Wild Harmony Farm products are available wholesale, through their CSA (Community Supported Agriculture), and at their farm store. Read more about Wild Harmony Farm and farmers Rachael Slattery and Ben Coerper on their website.